Definition at line 149 of file llcloud.h. Definition at line 274 of file llcloud.cpp. References CLOUD_GROUPS_PER_EDGE, CLOUD_HEIGHT_MEAN, f, i, j, mCloudGroups, mNeighbors, NULL, S32, LLCloudGroup::setCenterRegion(), LLCloudGroup::setCloudLayerp(), x, and y. Definition at line 303 of file llcloud.cpp. Definition at line 540 of file llcloud.cpp. Definition at line 309 of file llcloud.cpp. References CLOUD_GRIDS_PER_EDGE, f, i, llassert, mDensityp, and mRegionp. Definition at line 463 of file llcloud.cpp. References decode_patch(), decode_patch_header(), decompress_patch(), gBuffer, init_patch_decompressor(), mDensityp, LLGroupHeader::patch_size, set_group_of_patch_header(), and LLGroupHeader::stride. Definition at line 328 of file llcloud.cpp. References CLOUD_GROUPS_PER_EDGE, i, j, mCloudGroups, mDensityp, mWindp, NULL, and S32. Referenced by ~LLCloudLayer(), and LLViewerRegion::~LLViewerRegion(). Definition at line 570 of file llcloud.cpp. References disconnectNeighbor(), i, and S32. Definition at line 554 of file llcloud.cpp. References gDirOpposite, mNeighbors, and NULL. Definition at line 521 of file llcloud.cpp. References CLOUD_GROUPS_PER_EDGE, i, j, mCloudGroups, NULL, and S32. Definition at line 373 of file llcloud.cpp. 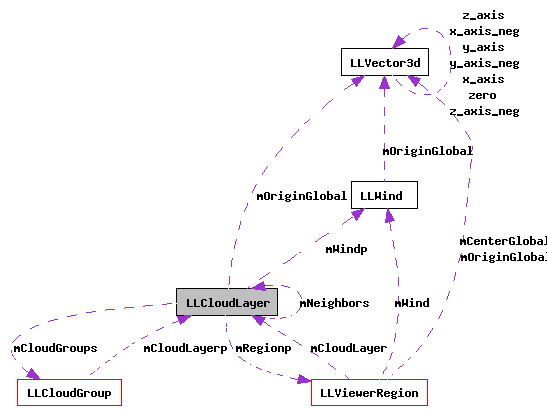 References CLOUD_GRIDS_PER_EDGE, i, j, lltrunc(), mDensityp, mMetersPerGrid, LLVector3::mV, S32, VX, and VY. Referenced by idle(), and LLCloudGroup::updatePuffs(). Definition at line 181 of file llcloud.h. Definition at line 168 of file llcloud.h. Referenced by LLCloudGroup::inGroup(), and LLCloudGroup::updatePuffs(). Definition at line 429 of file llcloud.cpp. Definition at line 347 of file llcloud.cpp. Definition at line 170 of file llcloud.h. Definition at line 323 of file llcloud.cpp. Definition at line 366 of file llcloud.cpp. References CLOUD_GRIDS_PER_EDGE, mMetersPerEdge, and mMetersPerGrid. Definition at line 352 of file llcloud.cpp. References mDensityp, mWindp, NULL, and LLWind::setCloudDensityPointer(). Definition at line 508 of file llcloud.cpp. References CLOUD_GROUPS_PER_EDGE, i, j, mCloudGroups, and S32. Definition at line 495 of file llcloud.cpp. Definition at line 479 of file llcloud.cpp. Definition at line 201 of file llcloud.h. Referenced by destroy(), findCloudGroup(), LLCloudLayer(), updatePuffCount(), updatePuffOwnership(), and updatePuffs(). Definition at line 199 of file llcloud.h. Referenced by create(), decompress(), destroy(), getDensityRegion(), and setWindPointer(). Definition at line 193 of file llcloud.h. Definition at line 189 of file llcloud.h. Definition at line 190 of file llcloud.h. Referenced by getDensityRegion(), and setWidth(). Definition at line 196 of file llcloud.h. Referenced by connectNeighbor(), disconnectNeighbor(), getNeighbor(), and LLCloudLayer(). Definition at line 188 of file llcloud.h. Definition at line 198 of file llcloud.h. Referenced by create(), getRegion(), and setRegion(). Definition at line 197 of file llcloud.h. Referenced by destroy(), and setWindPointer().